Are you looking for a Mazda dealer you can trust? Look no further than Mazda 2-20, your trusted Mazda dealer in Pincourt! 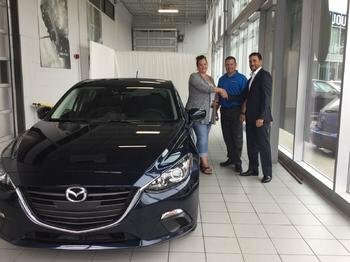 We offer a complete inventory of new and used Mazda vehicles, as well as high-quality after-sales service for your Mazda. Your Pincourt Mazda 2-20 dealer is proud to present the complete new Mazda vehicle collection. Come in today and discover what all the hype is about with Mazda’s collection of brand new vehicles and their exclusive, exceptional SKYACTIV technology. Mazda 2-20 also offers a wide selection of used cars at a great price. Mazda 2-20’s team of experienced sales representatives is available to accompany you throughout your search for a new or used vehicle. We offer personalized customer service that will surpass your expectations, plus you will benefit from Mazda 2-20’s philosophy to provide each of its customers with an enjoyable car-buying experience. Whether you're looking for a used vehicle or a brand-new car or sport utility vehicle, our staff is ready to help you find the right one for you. At Mazda 2-20, our team of sales consultants will answer all of your questions in order to help you find the new Mazda vehicle that is perfect for you. Then, once you have found the perfect new or used vehicle, allow our team of experienced financing and leasing experts to guide you in finding the perfect financing solution. We make every effort to facilitate access to credit. If you have run into financial difficulties, come to Mazda 2-20, where we offer the highest acceptance rate in the West Island when it comes to financing. Mazda 2-20 has an impressive selection of new vehicles of all kinds at great prices and for every budget. Come in today and discover the Mazda CX-5 SUV, the first vehicle to feature Mazda’s exclusive SKYACTIV technology. We also offer a wide selection of new Mazda3 and Mazda3 Sport models, the Mazda6 midsize sedan, the Mazda CX-3 subcompact SUV, as well as the spacious Mazda CX-9 and the sporty Mazda MX-5 convertible. Mazda 2-20 also offers you a varied inventory of used cars and trucks from several manufacturers including Acura, Honda, Dodge, Chevrolet, Nissan, Ford, Kia, Mitsubishi, Toyota, and more. Our used vehicles are inspected by our qualified technicians so that each unit meets the highest quality standards. At Mazda 2-20, our expert mechanics know your car inside and out and will show you on how to preserve and improve its performance and reliability. At Mazda 2-20, we use original parts and our team treats each vehicle with the care and dedication you expect. Mazda 2-20 invites you to visit our website regularly. Take advantage of our virtual tour, ask for additional information, check out our regularly updated inventory of used vehicles, request a "Mazda 2-20" price, pre-approve your financing, and even buy your vehicle online! Plan a test drive of one of our new Mazda vehicles or used car range today at Mazda 2-20.